One week down for marathon training. I bet you won't be surprised when I tell you I altered the plan already. I set out thinking I'm going to follow a plan, then I go and register for races and it throws off my plan. Yes, I could still stick with the plans but when I pay for a race, I want to do well. I know my body and I know I need to rest/recover, so I give myself permission to do so. 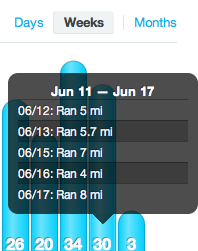 And while I didn't exactly stick to the plan, I still ended up with more mileage than I was supposed to. I had added more distance into the shorter runs so I could make my long run shorter on Sunday. Now I'm officially in taper mode and I'm going to follow the plan I followed the week prior to my (shocking) half marathon PR from Race the Runways in April. Which means, I'm not going to be following the marathon plan again this week...and my mileage will be down. We'll see if my plan works. My goal for Sunday's KRRT 1/2 is to have a person best for the course. Last year's time was 1:49:09. I am not shooting for a 1/2 PR (1:44:04) - this course is far different than Race The Runways. I'm running MDI too! What plan are you using? A tweaked version of the Train Like a Mother - "Own It" plan. We'll see if it works! What plan are you using? you should shoot for a PR! & will you be shooting for a PR as well???? As I remember, your last 1/2 was rockin. I though that I made that statement public, then I'd actually believe it as well. I'm trying to let go of time and not stress about it. Is it a girl thing? The time/PR issue? My husband doesn't seem to care and I stress so much about it. I have to let go and just enjoy and take those PRs when they come and not beat myself up when I don't. I love running and that should be enough. :) & flexibility is most important. Thanks for understanding! I like having a plan, but we usually modify it as we go. Not as much flexibility with our marathon plan as with our triathlon plan but it still leaves some wiggle room. You are going to do great on Sunday! There is always wiggle room, right? We'll see how I do on Saturday. It's "home field" advantage - but I just really want to enjoy myself! Good luck! I won't be the least bit surprised if you run a personal best on the course and set a new PR! You are always so supportive and sweet! We'll see. :) Thank you! Glad to see you are running KRRT! I'm excited and anxious at the same time. Hoping it's not ungodly hot!! Also hoping to better my RTR time:/ Good luck, I know you'll do great!! I'm still working on a strategy for marathon training (which officially begins after KRRT). You sound like me.. I alter it week after week. Good luck on you race speedy girl.. what cha wearing? I am a running outfit o'holic .Speaking of running clothes.. love my cheetah capris, they are so cute. I always "fix" my training plan and it always works out. :) Good luck this weekend!!! Can't wait to hear how it goes! You sound like you're in control! Good luck! Tapering is so hard yet so important, so rest up and get those legs ready to crank!! Have fun too. I actually LAUGHED aloud when I saw "what you actually did" and how it consisted of all running and nothing else ;) I love it!!! !